However, we have every right to be disappointed when large amounts of public funds are spent on projects developing virtual learning spaces which could disappear overnight. It’s exciting and essential to explore the educational potential of tools and systems such as Second Life, but significant investment requires caution. When locked up inside a proprietary system, the value of ‘virtual real estate’ can be reduced to zero overnight if it needs to be rebuilt from scratch. Decision makers who allocate substantial funds to such projects should expect standard risk management practices to be in place to ensure that loss of investment is minimised. It’s common sense – and in a shrinking economy, anything else is unacceptable. * I’m not saying that I support this model, just that it is prevalent and it is predictable that private companies will act in the interests of their shareholders first and foremost. Related post: How secure are your course materials online? 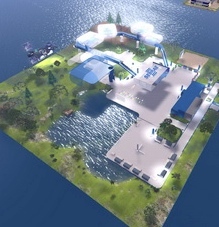 This entry was posted in Learning technology and tagged education, management, project, risk, second life on October 26, 2010 by Paul Left.